Brutal drive this morning on highway 401 along the north shore of Lake Ontario. Total whiteouts and very windy. @sanderson wrote: Be oh so careful! We are home safely now with my Mom who will be 91 on December 31st. She travelled well . But we had to leave her in the car in the driveway for a while until I could shovel a ton of snow off the front walkway so that we could get to the front door. It feels so good to be home again. Looking forward to a good cup of coffee. Now where is that Baker Creek seed catalog? Weather in Ottawa when we arrived was 2F (-17C) and with the 33 mph wind gusts it feels -21F (-29C). Polar vortex for a couple of days then we are going to get hit with a Colorado Low which is going to bring lost of snow on the weekend. Turned off the pump in the fish pond. I could still hear the water coming out of waterfall but everything is covered in ice and a foot of snow so I can't see what is going on. I don't want the pump to accidentally pump the water on top of a layer of ice and then drain the pond. Have to wait for the Spring opening now to see if any goldfish survive the Winter. Glad you got home safely, TD. Best wishes to your mom. I can just imagine the goldfish pond being drained by having all the water on top of the ice. I hope you caught it in time, then I would expect that some goldfish will survive if there is enough deep water. I am sure you will all sleep well tonight. Hope you stay put until the cold weather breaks. At this time of the year it falls on me to make small mince-meat pies for Christmas. The reason is that not many in the family like them but I sure do. In the meantime, Mrs TD got my 90 year old (91 on Dec 31st) Mom into the action. 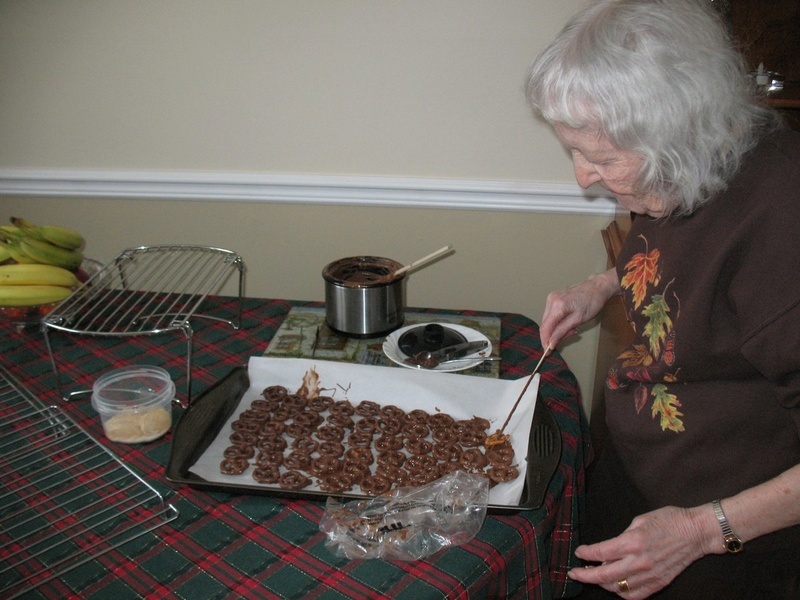 Here she making chocolate covered pretzels. The chocolate was melted in a mini crockpot. 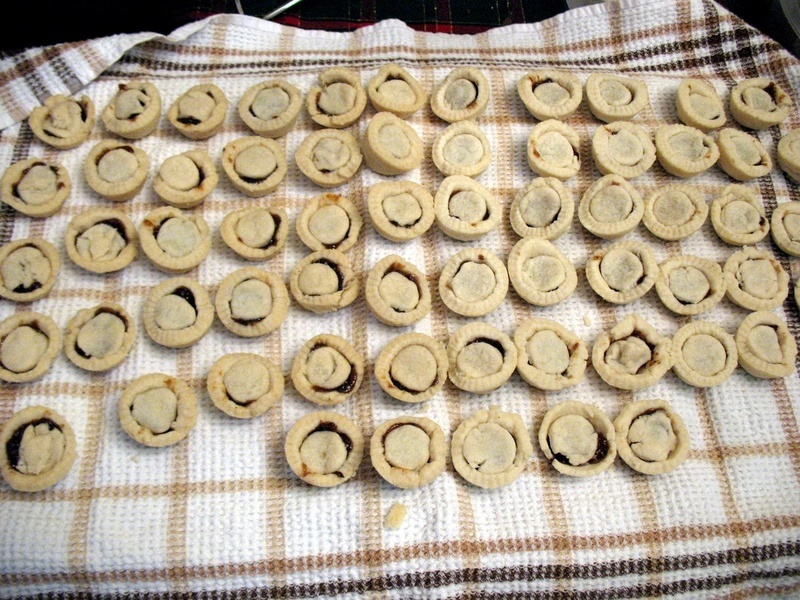 And here are the over five dozen mini mince-meat pies that I made this afternoon. I know they don't look pretty but they sure taste good. A few already disappeared into my tummy before this photo was taken. TD. those mini mince pies may not look "commercial" but they certainly scrumptious. And "Hi" to your mom, nice to "meet" you. Enjoy your Christmas with your son and all your family. Looks & sounds like you're all having a wonderful time.... And, yes, those pies DO look scrumptious. I also like mincemeat. I've got a pear mincemeat that's wonderful. I'll see if I can find the recipe & post it. @Kelejan wrote: TD. those mini mince pies may not look "commercial" but they certainly scrumptious. Canadian mincemeat, with or without meat? Either way, I like them. ... apples, currants, orange peel. lemon peel, beef suet, blackstrap molasses, rum, brandy, spices and a bunch of other things that cannot be good for your health. I think I need to start making my own mincemeat from now on. FINALLY, we have some real snow here in my neck of the woods. So far this season I have spent about 15 minutes shovelling snow to make a path down my driveway. When it is light, I have have to make a bigger effort. This afternoon I will be out for some hours, and as two days of snow are forecast, there will be more work to do. This is the one time I am happy not to have a car and a whole driveway to clear. It leaves me more energy to get out the snow shoes over Christmas and the New Year. A difference this year is that so far we have not had the snow/melt/freeze sequence that causes so many slippery sidewalks and blocked drains. Seems to me that pedestrians get the worst treatment, or should I say, lack of treatment. The biggest bugbear to me is the tunnel under the railway tracks, as it is too narrow to permit the sidewalk machines. The slope leading to it never gets the sun and the handrails are out of reach. The slope is where may of us fall as there is often no salt/sand/grit laid down which is generally a one person job and we have to send in a request, then they go overboard and lay half an inch on the upper part and then run out of material. Enough complaining; the snow looks very pretty, falling gently on to the roads and trees etc and covering up all the work I should have done before winter. The temperature will not go above freezing for a week so it should look nice and clean. ETA: Looked out again just now, it is still dark here, I take back what I said about gently falling snow. It is coming down at a 45 degree angle, the opposite direction to the last time. At least it is not so bitingly cold. Sounds gru...er, um, pretty, Kelejan. TD, I LOVE choc covered pretzels. Go Momma go! Kelejan ... where are you??? Some may wonder how I came up with my forum User ID, "trolleydriver". 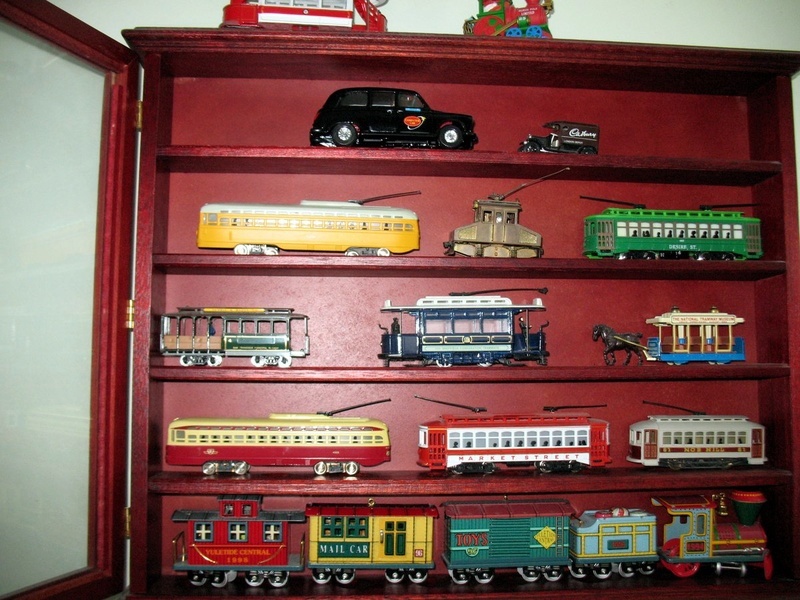 It's because I really like the old trolleys. I even have a few models as seen in the following photo. On a sad note, we lost a neighbour (3 houses away) to a brain hemorrhage. Never fear, TD, I'm still here. Thanks for holding up the Canadian thread. Had some fun with the new city garbage can yesterday. When I went to insert my weeks garbage I found that the lid had frozen shut. It seemed that snow or rain had blown round the corner where I keep the can, and just froze it shut. Think of me in the dark at six in the morning trying to unfreeze it with hot water. I managed it, then had to make sure it was as dry as possible so that it would not re-freeze for when the garbage truck came to do pick-up. Put in my garbage and trundled down the driveway to the road, wishing all the time that I should have asked for the half-sized one. Down at the curbside I unlocked it and put a rolled up paper there so that the lid would not shut tight and freeze again. Only a little snow these past days, just enough to clear the walkway to the road for the second time. So far having an easy time of it. At least we have passed the Winter Solstice. Apart from that I called in at Canadian Tire and bought some potting soil as all mine had frozen solid. Note for next winter; makes sure I have the makings for potting plants. I have three peony seeds that have sprouted. At last! @Kelejan wrote: . . . Had some fun with the new city garbage can yesterday. When I went to insert my weeks garbage I found that the lid had frozen shut. It seemed that snow or rain had blown round the corner where I keep the can, and just froze it shut. Think of me in the dark at six in the morning trying to unfreeze it with hot water.
. . . we have passed the Winter Solstice. What I call real snow has finally arrived here. It certainly looks like fairyland. Yesterday I completely cleared the driveway in case neighbours would like to park their visitors' cars. but the snow was only a little bit heavier and it gave me a good workout without overdoing it. Now to phone a couple of neighbours to offer them parking spaces over Christmas and Boxing Day, starting with a Christmas Eve gathering this evening. Today I have an afternoon gathering starting at 2pm and then the Christmas Eve party starting at 6pm. I will have to really pace myself. MERRY CHRISTMAS to all our Canadian posters and readers and also to everyone around the World who posts on and reads this wonderful SFG Forum. She who shovels snow in the morning and parties the rest of the day. What an inspiration you are. Merry Christmas and Happy Boxing Day. @sanderson wrote: She who shovels snow in the morning and parties the rest of the day. What an inspiration you are. Merry Christmas and Happy Boxing Day. I hope you have had a great Christmas, Sanderson and enjoy Boxing Day tomorrow. I may be wrong but I think Boxing Day is only a UK and Commonwealth countries holiday. Mrs TD and daughter TD are looking forward to the Boxing Day sales.
" I may be wrong but I think Boxing Day is only a UK and Commonwealth countries holiday. Mrs TD and daughter TD are looking forward to the Boxing Day sales." You are right, TD. It was the day that the Servants got their annual gifts from their Masters. After all, the servants slaved away all the year and worked many days preparing for Christmas so they deserved something for their loyalty. By the time the USA arrived, I expect that most people shifted for themselves. Now to start looking froward to the New Year amd a new season of gardening for us here in Canada. Environment Canada's weather warning for Ottawa today is for freezing rain and their statement includes the following sentence: "Public Safety Canada encourages everyone to make an emergency plan and get an emergency kit with drinking water, food, medicine, a first-aid kit and a flashlight."